Earlier this week, TheDailyBeast.com released its rankings of "America's Smartest Cities," from first to worst. The popular news and blog site ranked metropolitan areas--the cities and their suburbs--of 1 million people or more, which gave them 55 in all. So being ranked number one means your city is the smartest, and being ranked 55th means your city is the dumbest. 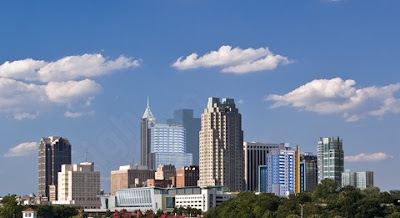 Raleigh, North Carolina wins the honor of being ranked America's Smartest City. In creating the rankings, The Daily Beast divided the criteria into two halves: half for education, and half for intellectual environment. The education half encompassed how many residents had bachelor’s degrees (35 percent weighting) and graduate degrees (15 percent). The intellectual environment half had three subparts: nonfiction book sales (25 percent), the ratio of institutions of higher education (15 percent), and the percentage of eligible voters who cast ballots in the last presidential election (10 percent). About number-one ranked Raleigh-Durham, which has a metro area population of 1,578,527, The Daily Beast writes: "Raleigh-Durham has just about every intangible useful in attracting and developing a smart populace: It’s a university hub, including two of the nation’s elite schools (Duke, the University of North Carolina, Chapel Hill and North Carolina Sate University), and those schools led to one of the nation’s great technology incubators (Research Triangle). On top of that, Raleigh, as the state’s capital, attracts engaged political minds, as well." Break out the foam fingers, Raleigh is number one. Rounding out the top five on the list of smartest cities are San Francisco, Boston, Minneapolis-St. Paul, and Denver. Charlotte, with a metro area population of 1,701,799, ranked a not-too-shabby 16th. "Charlotte, home of Bank of America and Wachovia, may be taking a recessionary licking, but its above-average citizenry positions it to bounce back," The Daily Beast surmises. "Charlotte scored high in bachelor’s degrees per capita, but its strongest showing was in the voter-participation category. A commitment to civic duty shouldn’t come as a surprise from a patriotic city like Charlotte. British Revolutionary War General Charles Cornwallis was so put off by Charlotte’s nationalistic fervor that he called the city 'a hornet’s nest' and unwittingly became the only 18th-century military figure to name an NBA franchise." Other notable rankings: New York, 13th; Chicago tied with St. Louis for 24th; Los Angeles tied with Pittsburgh and Richmond for 27th; Greensboro tied with Jacksonville for 37th; and Las Vegas at 54th: "A city that prides itself on sin performs predictably for each of our intellectual-based criteria." And arriving in the caboose is Fresno, California at 55th. "The race to the bottom wasn’t even close. The largest city in California’s San Joaquin breadbasket, Fresno, had deficiencies across the board. College education (less than 20 percent of the local population have four-year degrees), graduate studies, academic institutions (not much besides Fresno State), book purchases, voter engagement—it ranked in the worst 5 percent in almost all of our categories. Problems with gangs and crystal meth tend to deter the best and brightest." New H&M Goes to Raleigh, Not Charlotte...Why?